can you carry?? i have heard different answers..
You want to after dark. Here is the section that I believe allows me to carry at the State Fair. Of course, if a LEO feels differently, you might still go to jail. We each have to decide if the risk is worth the benefit. I have decided that it is. 6. Any place where pari-mutuel wagering is authorized by law; and 7. 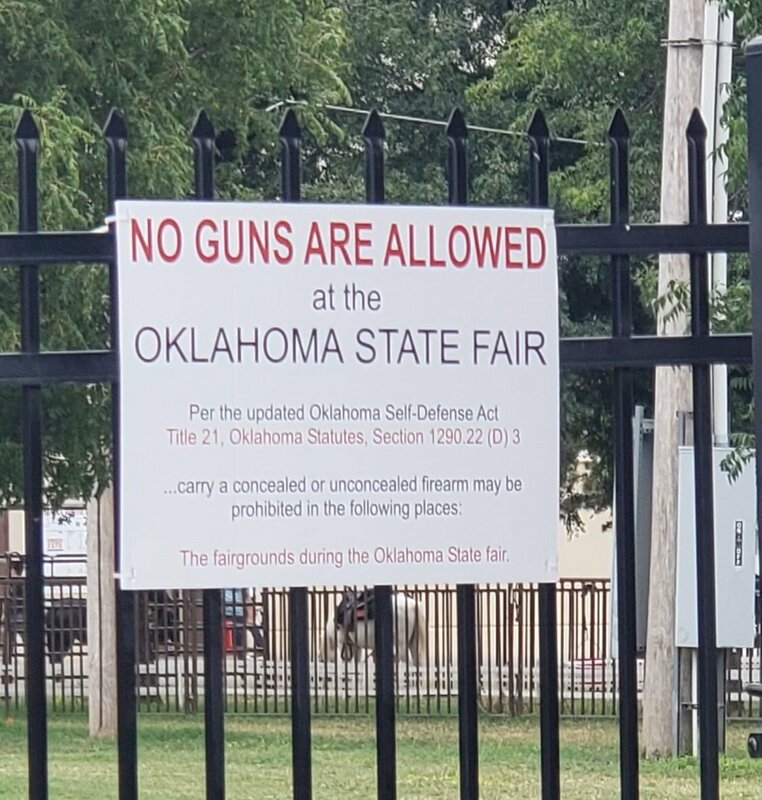 Any other place specifically prohibited by law. 4 Any property designated by a city, town, county, or state, governmental authority as a park, recreational area, or fairgrounds; provided nothing in this paragraph shall be construed to authorize any entry by a person in possession of a concealed handgun into any structure, building, or office space which is specifically prohibited by the provisions of subsection A of this section. Someone told me this sign was up but I didn’t see it. It is. I carried when I went, and seen no signs. The big question is.....who wants to go to the fair? Me! The people watching is the best! Also, there is free wine!! I think they just put the sign up that says $1.00 for 2 samples to make it look legit. No money necessary! Pffft...I can watch the people of Walmart for free at their home base and open carry there with no gunbuster signs. No free wine tho. I give you that. I think that was a movie line from way back in the day spoken by Mae West to Gene Barry. No, I'm showing my prowess in googlfu. I thought you pups were born with this internet stuff in your baby bottle formula.